WWF is the world’s leading conservation organization. It was established in 1970 in Pakistan with the mission to stop the degradation of our planet’s natural environment and to build a future in which people live in harmony with nature. For the past four decades, WWF-Pakistan has been committed to providing quality environment education to raise awareness about the value and benefits of natural resources of Pakistan. 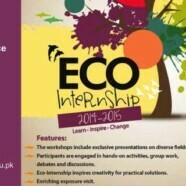 Earth Watch club is conducting the Eco Internship Session, 2014 at Forman Christian College. 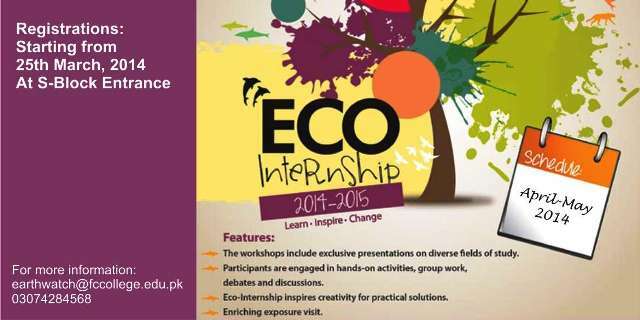 The Eco Internship Program consists of interactive sessions (which will be held at Forman Christian College by WWF’s expert team) on a diverse range of topics including sustainable development, biodiversity, environmental law, documentary making, solid waste management, water conservation, alternative energies and nature photography. Hands on activities like interactive discussions and creative challenges are part of this extensive program. Enable students to generate an insight into the interaction between organisms and their environment. Create awareness of environmental challenges and inspire sustainable solutions for environmental conservation. Broaden scope as responsible custodians of valuable natural resources. Inculcate a sense of civic responsibility in individuals. Provide an opportunity to become an official ambassador of WWF-Pakistan. WWF certification upon successful completion of the programme. Complementary membership of WWF-Pakistan for one year. Exclusive discount on Eco-Travel and Panda Products. Free digital copy of Natura magazine. Invitations to WWF-Pakistan’s annual events. Current enrollment in any of the FCC’s academic program. Registration forms are available at the desk at S-Block (Armacost Building) entrance.